I pay 25% of my monthly income to after school education for our two primary school students. This is a thriving sector. The points requirements for early childhood education--the degree required to work in this important secotr--have started climbing and are "up 25 in Marino to 345, 20 in DCU to 400, 15 in Mary Immaculate to 375, and five in UCC to390" according to the Irish Times. Part of my teaching duties lie in delivering modules to business students. Standard business degrees now require higher points to enter with points up by "10 in NUI Galway to 400, and up five in DCU, UCC, DIT and UL, to 470, 460, 450 and 425 respectively". Brian Mooney spotted "the new business degree programme in Trinity, TR080, has the highest points requirements within the sector, at 535". My main area of focus, computer science, shows an "up and down" field of entry across Ireland. Entry points have increased by "25 in DIT to 450 and 10 in UCD to 485. Computer science and business is up five in Trinity to 505. Computer science is down five in UCC to 435, and down 10 in Trinity to 480". DCU's multimedia programme now requires 450 points to get a first choice offer. Applicants can get a place on the very strong multimedia programme we teach in LIT-Clonmel with 100 fewer points than in DCU. 1. Brian Mooney -- "Biggest increase in demand for courses around construction" in The Irish Times , 22 August 2016. 2. Bernie Goldbach -- "Behind the CAO Headline Points ", InsideView.ie, August 17, 2015. ++++ Bernie Goldbach teaches creative media for business in the Limerick Institute of Technology. 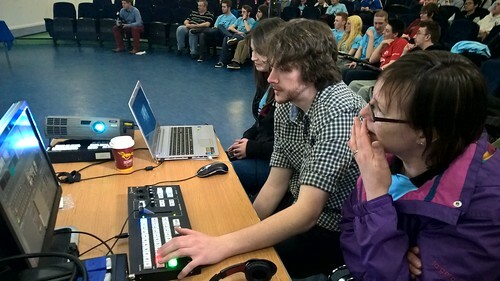 Photo of three creative multimedia students running the Tricaster at a live event.